Tee hee hee! I just won My Friend Amy's giveaway for the first two seasons of Buffy the Vampire slayer! SWEEEEEEEEEEEEEEEEEEEEEEEET. Anyway, it's Nonfiction Monday and I'm reviewing another short-listed Cybils book. Have you read Russell Freedman's Lincoln: A Photobiography? Good. You don't need to read this. While the visual design may be more appealing than Freedman's book, Lincoln Through the Lens is the same concept, with less depth. 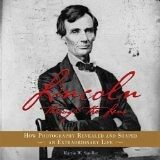 The concept of the role photography played in Lincoln's life and presidency is a great subject for a kid's book. However, it's going to be very, very hard to top the Freedman book. I mean, I liked this one, just not as much as Freedman. Then I got to the end. At the time, most of the land in the United States west of the Mississippi, amounting to millions of acres, remained unsettled... By 1900, thanks to the the Homestead Act, more than eighty million acres in the west had been settled and more than 372,000 farms had been created. In an entire page on Westward expansion, that is the picture given. Vast open stretches of land that we went and settled. Only, of course, that land did have people living on it and the Homestead Act and the westward expansion it created has some severe issue surrounding displacement of Native Americans. It would not have been overly difficult to rewrite the section saying that people saw the land as unsettled and moved West. It couldn't even mention the displacement of Native Americans? Instead, they're just missing entirely--ignored completely. Sad. Round up is over at Tales from the Rushmore Kid. Did you know there is a National Park site devoted to telling the story of the Homestead Act of 1862? To learn more about what may be the most influential piece of legislation this country has ever created go to www.nps.gov/home or visit Homestead National Monument of America. Located in Nebraska, the Monument includes one of the first 160 acres homestead claims but tells the story of homesteading throughout the United States. Nearly 4 million claims in 30 states were made under the Homestead Act and 1.6 million or 40 percent were successful. The Homestead Act was not repealed until 1976 and extended in Alaska until 1986. Homesteads could be claimed by “head of households” that were citizens or eligible for citizenship. New immigrants, African-Americans, women who were single, widowed or divorced all took advantage of the Homestead Act. It is estimated that as many as 93 million Americans are descendents of these homesteaders today. This is a story as big, fascinating, conflicted and contradictory as the United States itself. Learn more!